Only domestic animals will be accepted: ie. Dogs, cats and small household birds. No snakes, lizards or goats. Cats and dogs HAVE to be older than 8 weeks, although 12 weeks is recommended. 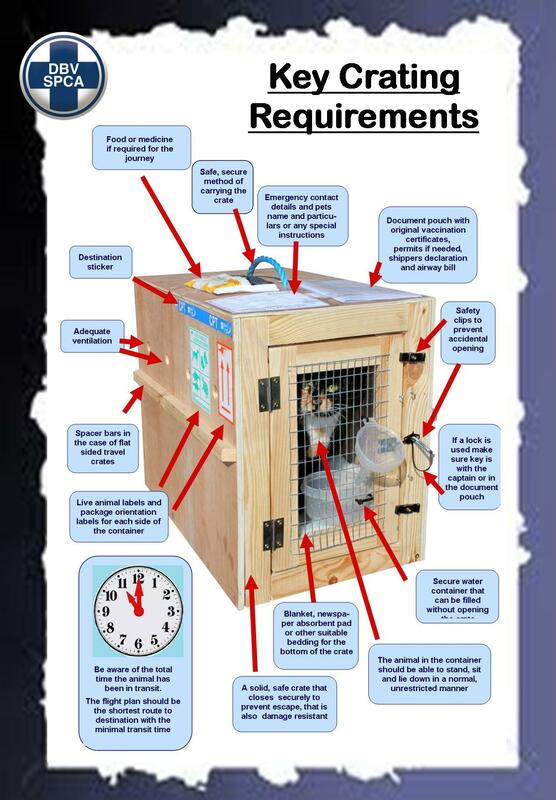 The pet must be carried in a safe and humane container that is leak proof, made of a suitable material, big enough for the animal to stand up and turn around and not weighing more than 32kg with your pet inside it. See additional info on suitable containers for pets. Owners must ensure that their pets have valid health and vaccination certificates, entry permits and other documents required by law. You can view these guidelines issued by the government in August 2016. The animal is not suffering from disease or injury. Your pet and container, plus his/ her food won't be included in your checked in baggage allowance. Excess baggage rates will apply. At the time of writing, the fees were R50 per kilogram (may have changed), with a maximum weight of 32kgs. These fees can only be paid at the airport. Bookings for your pet to travel with you need to be made in advance. To book call Mango's call centre on 086 100 1234. Guide dogs accompanying guests with disabilities can travel free of charge. They are allowed in the cabin with their owner but not to occupy a seat.